Quick, Cost Effective, and No Mess! 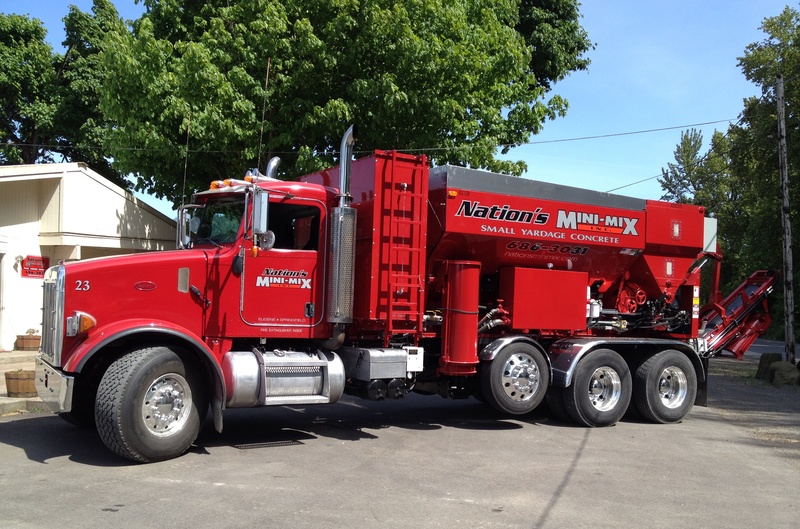 Established and operating since 1994, our mix-on-site concrete offers a unique system providing small yardage concrete delivery. We are dedicated to producing the highest quality concrete and deliver it to you in the most expedient manner. No more long hours of heavy labor mixing sacrete, no waste and no messy clean-up! Concrete is extremely heavy, weighing almost 2 tons per yard. It takes approximately 40 bags of sacrete to equal 1 cubic yard! Do you really want to do all that work yourself? How does our operation differ from the standard ready-mix delivery? We invite you to read the following, and you will see just how our unique system satisfies the need for small yardage concrete with both a superior product and delivery. We haul all the ingredients for concrete (sand, rock, cement, water and additives) in separate compartments on our truck. According to each customer’s strength specifications, gates are set at the outlet of the sand, rock and cement compartments, allowing the proper amount of each to drop onto a conveyor belt. This continuously moving conveyor belt transports the material to the rear of the truck where water and additives are added as it enters a 9′ auger, which mixes all ingredients together while it travels down toward the chute where it emerges as fresh concrete. All our concrete mixes are metered off the truck to the nearest 1/4 yard. We can deliver as little as a few bucketfuls or as much as you need. You pay only for what you use (1/2 yd min. in town, 1 yd min. out of town.) There is never any “leftover” concrete dumped at your job site. Maximum delivery is 7cu. yards per trip. Unlike ready-mix trucks, our concrete mobile is equipped with a unique remote drive system, allowing the operator to move and steer the truck from a control station at the rear of the unit. At many job sites, this valued feature saves substantial time and money. It is unnecessary for the operator to jump in and out of the truck repositioning it to complete a pour. Why is fresh concrete a superior product? Concrete is a combination of inert materials (sand and rock which are referred to as “aggregate”, and serve as a filler), and a paste composed of cement and water, which changes from a semi-liquid substance into a solid binder as a result of chemical reactions between water and various compounds in the cement. This process begins immediately after the mixing of all ingredients. Ready-mix concrete is mixed together at a batch plant and transported by truck in a rotating drum to the job site: therefore the curing process is already underway during travel time. This minimizes the time available for finishing, and in some cases, requires the addition of extra water to maintain concrete with enough fluidity for pouring, which reduces its strength. Because Nation’s Mini-Mix concrete is mixed right at the job site, your concrete is ALWAYS FRESH. It also has a more plastic texture for superior workability, and allows you the maximum finishing time. Unlike ready-mix, there is no need to add extra water to keep it fluid, assuring you the correct strength your job requires. I just wanted to thank us for a speedy delivery and that your driver did a great job! Many businesses don’t seem to care about customer service. It’s very refreshing to see someone go to such lengths to ensure customer satisfaction!